SEO is an ongoing process to obtain a high search rank but contrary to popular belief it cannot be used an independent tool. There are no search engines, it’s just the all mighty Google. So tiny in numbers are the few who ‘Bing’ in T&T, that they could probably fit on the head of a pin. Did you also know that Yahoo’s search results are powered by Bing? After Facebook, the second most visited site in Trinidad & Tobago is Google. There’s a strong case for not treating Bing/Yahoo like an outside child in your SEO strategy but only in the long term view. In the here and now Google.TT is a Trini. Why is this so? The reason is simple: THAT’S ALL THAT’S AVAILABLE TO RANK! and hence, no competition. 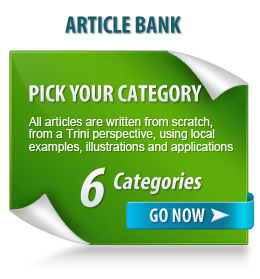 TRANSLATION: There are hundreds of vacant keywords/keyphrases for the taking in T&T search! I’ll be quick to caution that without much effort, a slightly better optimized site can rise up the rankings. But you know the saying: in the land of the blind, the one-eyed man is king, so such a rise to the top is no accomplishment, and nothing to crow about. The goal of SEO is to drive traffic to your website. The goal of your website is to convert visitors into customers. When a visitor clicks on your search result, that’s SEO saying ‘here you go, another one’, and hands off the visitor to your website. If your site can’t finish the job, then all your hard work is for nothing. Save the hard work for the website first. Forward Multimedia doesn’t game the search engine, but use techniques of good web design accepted and recommended by Google (White Hat SEO) and I stay away from unapproved tactics (Black Hat SEO). Optimizing for search engines starts with applying basic best practices as the foundation of more focused techniques at the next level. Google is a VERB and you can so Google! It’s as natural as breathing. Anything you want to know you just have to Google. In fact there is a site called LMGTFY: ‘Let Me Google That For You’, that sarcastically answers questions asked by people on forums by showing how to type the question in the Google box! You don't have to be number one! The top spot on Google search is super great, but here’s the good news, you don’t need to be the first result to earn the lion’s share of business. The top result is 100% guaranteed a visit and four just below about 99%, with the rate dropping for the bottom five results. Searchers don’t look for the best designed website, they’re looking for the site that provides the best emotional connection. Google can’t rank that… yet. What about Forward Multimedia's own SEO?